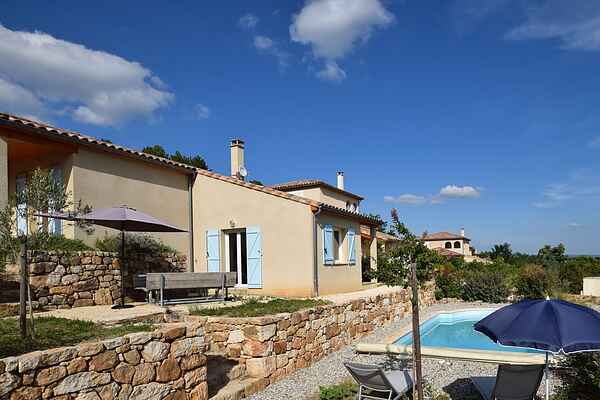 New, modern holiday home with central location in the Ardèche. Your villa is situated in an estate with several houses and is built against the side of a hill. The house and private swimming pool offer splendid views over the surrounding area and the pleasant little town of Joyeuse. The interior design of all villas is contemporary, cozy with a nice fireplace in the living room. Joyeuse has a rich cultural and historical heritage, including a 16th-century​ castle, the Tour de la Recluse and the chestnut museum​ \"Le Musée de la Châtaigneraie\". You'll also find shops, bakeries and a large supermarket here. The old town centre has some good restaurants, where you can enjoy a 'plat du jour' under the plane trees. Once a week, there is a market where you can buy local, fresh produce. Don't forget to try the ‘Macaron de Joyeuse’. This is a lovely macaroon with almonds and nuts and is a handmade local speciality. The tourist attraction of Vallon Pont d'Arc (25 km) makes a nice day out. The attractive town of Ruoms (15 km) shouldn't be missed either! Go canoeing, cycling, walking, swimming at lovely little river beaches: it's all nearby. The famous Grotte Chauvet Pont d'Arc is worth a visit, too.